The fourth generation of the classic Fluke 77 shares the same basic design and circuit board as the rest of the 170-series (175, 177, 179). Apparently a common problem with these circuit boards is the appearance of a white powdery residue that collects in certain areas. A couple have passed my workbench, and I’ve heard reports of more. Inspection of the PCB reveals various locations on the board with concentrations of the mystery residue. The area around the piezo beeper contacts shows a particularly heavy concentration of the stuff. There are other deposits, including some around the backlight LEDs. None of these areas are near the battery compartment, therefore battery leakage is not suspected. The usual procedure for PCB contamination is a good scrubbing with a toothbrush and 91% isopropyl alcohol (IPA). After this procedure, the PCB is allowed to dry thoroughly. This gets rid of the white residue. Examining the entire PCB closely with a magnifying lens reveals only one area of permanent damage. One of the copper traces connected to the backlight LED circuit has the appearance of being completely eroded away, breaking the connection. 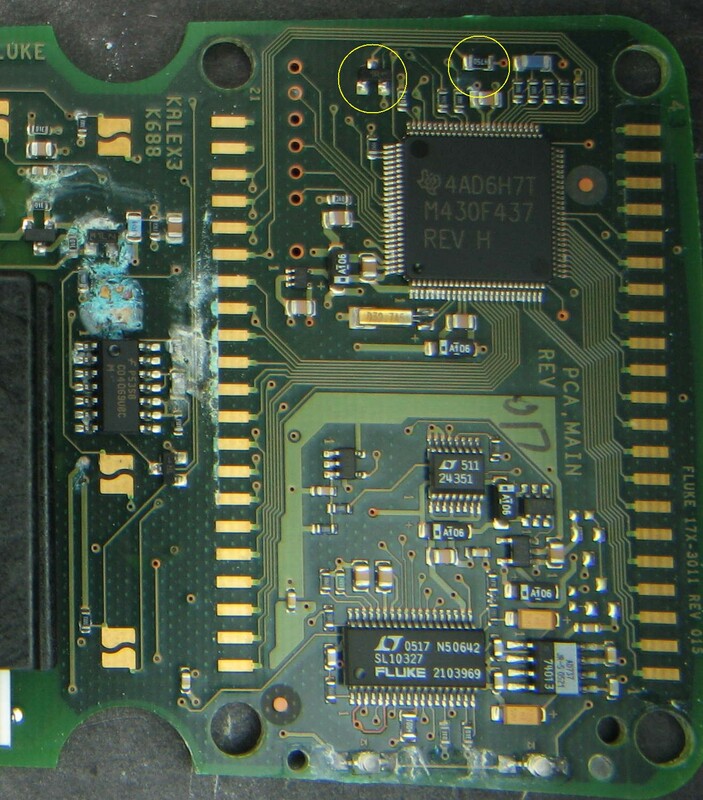 This damage is repaired by scraping some of the solder mask away, applying flux, and soldering a tiny piece of 30AWG tinned wire over the break. After the repair, all functions including the backlight and continuity beeper work. A thorough clean-up and lens polishing also improves the appearance. Epilog: The next unit I found with this copper corrosion problem was a 177, with the exact same PCB revision as this 77-IV. Unfortunately I did not photo-document the repair procedure, but it was quite similar to one described here. One of the pads for the backlight LEDs was eroded away causing the backlight not to work. The meter was non-functional with some digital-domain fault that caused it to always display “- – – -“. The trouble turned out to be a corroded via that was open from the top layer to the bottom, due to the plated-through hole being eroded away. A wire patch soldered in brought the 177 back to life. This entry was posted in Repair and tagged 170-series, Corrosion, DMM, Fluke. Bookmark the permalink. Thanks for this guide I used this technique to repair a laptop motherboard that had corrosion build up from being in a humid climate for years! Without this I would have never known it was so easily repairable. Excellent. Always good to hear about successful repairs. Thanks for sharing this information. I checked my Fluke 77 IV when I first read this article and found the beginnings of this corrosion in a couple of places. Later when I bought my used Fluke 175 the first thing I did was take it apart and inspect it for this problem but I did not find anything. I currently have a bad Dell PowerEdge 1850 power supply that has this type of corrosion all over a circuit board that I intend to see if cleaning this stuff off will restore its’ functionality. I’m relatively convinced it’s due to water-soluble flux residue. Time and place of manufacture would have a lot to do with whether it ends up being a problem or not. The key is to find it and clean it up before it erodes the copper. On the Flukes it seems to affect the beeper and backlight circuits, which just happen to be the parts that are powered directly from the 9V battery. So tiny leakage currents, even with the unit off, may be a factor as well. Hi, this is the exact same problem i have with my 77-4. I have got the 4 screws out and have the front and back apart. But how do i get the inside out so i can see the backside of the motherboard, so i can clean it up. I don’t wanna force it, but it doesn’t wanna come out. Are the more screws? I tried finding a teardown manual, without success. Remove the 440mA fuse. There’s a screw hidden under there. Will a alcohohol cleaning cloth do also to clean it up, which is used to clean the processor from paste residu? 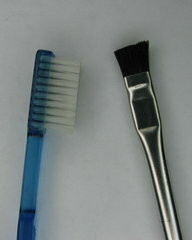 It will help, but I prefer using an acid brush with the bristles cut down and/or an old toothbrush. To find eroded copper you need some physical scrubbing action. Use plenty of alcohol and some paper towels to blot up the run-off. I did it with an alcohol cloth, but to be honest, there was almost no resideu at all. Everything look almost shiny new. I Cleaned it up, put it together, but still no backlight. I did a continuity test on the leds, no beep but they start burning a bit when i do that :), but when put together, no luck unfortunately. Any ideas are welcome. I am a starter in these things and this is my first quality meter to be honest, but i have high interest and wanna learn. There’s usually some tell-tale residue if copper erosion is a problem, but it may take a magnifying instrument to find it if there is any. Maybe this is a different problem. I’m running out of time for today, but here’s a photo of a 177 (same circuit board as 77-IV) with some very nasty corrosion. 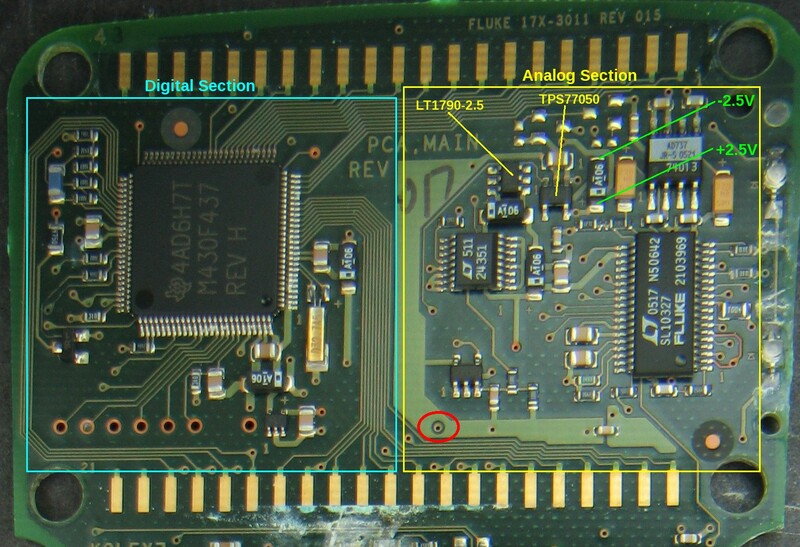 Check carefully the SMD transistor and resistor that I have circled in yellow. That includes the copper traces connected to them. Great! Glad you found the problem. Patience and persistence pays off. Hi Modemhead, I am writing from Italy. I have this multimeter 77IV (circuit board Fluke 17X) which does not work. In the display I can see only this sign “- – – -“, no numbers. I see right all the measuring selection (VDC, VAC, mV ecc..), I can read “LEAD” when I am in the A selection, and at the start I can read 77-IV. I read your message about this question and I will check better for corrosion. 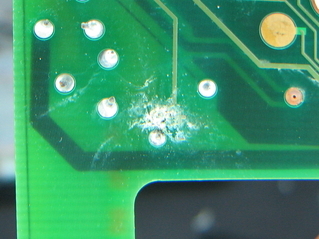 Do you remenber where was the hole eroded from the top layer to the bottom in the circuit board ? Stefano, this symptom occurs when the microprocessor loses communication with the analog measurement chip, for any number of reasons that would include a broken PCB connection, or even if the analog section loses its power supply. It is quite unlikely that yours would have exactly the same broken connection as mine. Nonetheless, here is a picture of a 17x board, the via in question is circled in red. I was never able to find complete documentation on this circuit or all of the parts, but data sheets for the two voltage regulators marked on the picture are easily found. This should help to verify that the +/- 2.5V power supply for the analog measurement chip is OK. The voltages are with respect to the COM input jack. I can see “—-” in every measurement ranges, except in frequency mode (Hz, pushing yellow button when you are in VDC), in this range I can read 0.00. Is it a useful clue ? Now with your info I try to verify if the analog circuit is good supplied. The fact that you get “0.00” in frequency mode does sound like a clue, but unfortunately I don’t know what to make of it. Measuring freq is a matter of counting pulses instead of A-to-D conversion. I once tried and failed to find data sheets for those Linear Tech chips which might provide answers. 3mA sounds too high. The 77-IV I have here draws 1.11mA in VDC mode with the LCD on. The 24351 is a LTC2435: 2.7V to 5.5V micropower 20-bit differential Delta Sigma analog to digital converters with integrated oscillator. The SL10327 is Fluke. The only thing I can think of is the possibility of one of the series protection components failing with a high resistance. This would have minimal effect on voltage measurements, but could decrease the amount of test current for the ohms, continuity, and capacitance functions. Check the big green 1K fusible resistor and PTC thermistor near the input jacks. The thermistor should be in the 1K to 1.5K range, and the resistor should obviously be 1K. Hmm. A newly arrived 77iv has the exact same issues yours had: no backlight, no continuity buzzer. After disassembly, I see some of the crud you mention, although mine’s not in the same spots. After cleaning, still no backlight, although the diodes themselves do light up when checked with another meter. Guess I’ll have to break out a magnifying glass. I take that back. I have white stuff corrosion exactly where you had to put your wire to fix the broken trace. Following everything around, and this is also the positive source for the piezo buzzer. Now to hunt up the wire and warm up the soldering iron. For some reason the backlight LED and piezo circuits seem to be most susceptible to corrosion damage on this model series (17x). Coincidentally, these two circuits are powered by the full battery voltage, everything else is regulated down. Good luck with your repairs. Yes. It’s an odd failure mode for a Fluke, it seems to me. The meter in question tends to be used in humid environments, and we have two meters failing in exactly the same spot. This is a current generation meter, so I’ve wondered whether I shouldn’t just avail myself of the lifetime warranty. I’ll probably be happier just fixing this one myself. Vb+ goes to the lowest leg of a SOT-23 device just above the large 1-ohm 400mA current shunt resistor and to the left of the shielded resistor network. I presume it’s a MOSFET or something having to do with automatic power-off. Yeah, no schematic is like working blind, and why I much prefer to work on older models. then I found an eaten trace under the upper of those two transistors that carries the switched voltage. Fixed that, and now have 3.3V and – – – – on the display. No voltages over on the analog chips, so I jumpered the switched batt+ after that lower transistor to the input to the 5V regulator. (Thanks for the part numbers) I don’t know if that jumper is supposed to be there, but now I get 5V across that one cap, and 2.5V at the output of the LTC reg with respect to batt neg. But I still get – – – – on the display, except at power up when it shows F177. I’m afraid this one has too much damage from corroded traces and vias. I have fixed a bunch of them already. Wow, I forgot that I had even made that graphic! Yes, the voltages are measured relative to the COM jack, which is usually considered to be analog ground on most DMM designs. Also, my recollection is that the negative battery lead is switched on these 17x meters, and positive goes through the previously mentioned FET. I’m away from home for a while right now and am unable to confirm that unfortunately. This is pure speculation, but I’m reasonably sure that a “—-” display happens when the processor loses communication with the A/D chips on the right side. Either they’re unpowered, dead, or the serial bus (I2C?) is interrupted. Similar to your problem, I have a wrecked 177 here with numerous corroded vias and traces, and I eventually had to give up on it and rob it for parts. I suspected problems underneath a chip that I could not see. Think I see my problem. If I measure using the negative meter input instead of battery-, I get +/-2.5V on that cap, as in your photo. So I guess that’s all good. But I still get only – – – – on the display in all ranges. Also, no range indication, like AC, DC, etc. Hi Again, I found the problem with the dashes on the display. The main chip feeds 3.3V to a resistor divider, and the selector switch selects one of the taps to pick a range and feeds it back to the chip. The trace that was connecting the voltage to the top of the divider was toast, so the chip was always getting 0V as the selection voltage, which is probably not a valid range selection. Anyway, now everything is working, except the mv range, which always reads 0. So I am making progress. BTW, is the white round selector switch part with the metal contacts on it in good shape from your “parts” 177? If so, and if you are interested in parting with it, please let me know. Thanks for your help with the meter. Nice work! I admire your persistence. I was unaware that this model uses voltage-encoded function selection. The 8x series I and III use that method, not sure about the series V. And now we know that can also cause the “- – – -” display too. And unfortunately most of the front-end stuff and all the plastic bits from this parts unit (ie. carcass) has already been allocated. Once agsin, I admire your persistence. I know how tedious it is to do that kind of repair. Hopefully the meter will continue to work and give a few more years of service. And thanks for adding your experience to the pages here. what did you use to clean the case to nice ? Basically, completely disassemble the unit and scrub the plastic parts with soap and water. See the blog post on Multimeter Clean-up for more details. Be sure to read the comments for more suggestions from other readers. I would like to know if anyone can measure the resistance between the output of this regulator and the negative of the battery to check if it is damaged. What does the Fluke SL10327 do in the circuit? My Fluke 177 not display nothing….. Its happen in sudden. Any directions to solve and back to life? Can you please give me some reference voltage points on the PCB for my Fluke 177. It not working and nothing in display. As you said, there is no -2.5 volt at the capacitor point. I measure 5 volt as you mentioned wrt to 2.5 volt… and which chip is 24351? Any datasheet you have?